If you live in the Phoenix area, you may have noticed that the roads that cross Baseline Road do a jog to the west. It's more noticeable on a map, and it has to do with something called "Sections", which is how the area was divided up, long before any of the roads were built. A section is a square mile, and in Arizona, it's determined by its distance from a point at the Initial Monument, which is on a hill right nearby Phoenix International Raceway, at the intersection of the Gila and Salt River Meridian (Avondale Boulevard), and Baseline Road. There's actually a physical piece of metal up there on the hill, and if you have more energy than I do, you may have hiked up there to take a look. 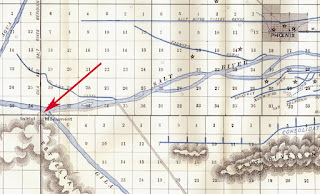 The map above, which is from 1892, shows that the sections above and below the Arizona Baseline (indicated by the red arrow), never really lined up correctly. I'm no expert on this kind of stuff, but I'm inclined to believe that the more careful surveying was done up near Phoenix, and as you got closer to the river, it wasn't quite so carefully done. I've also read that it was done intentionally to allow for the curvature of the earth. 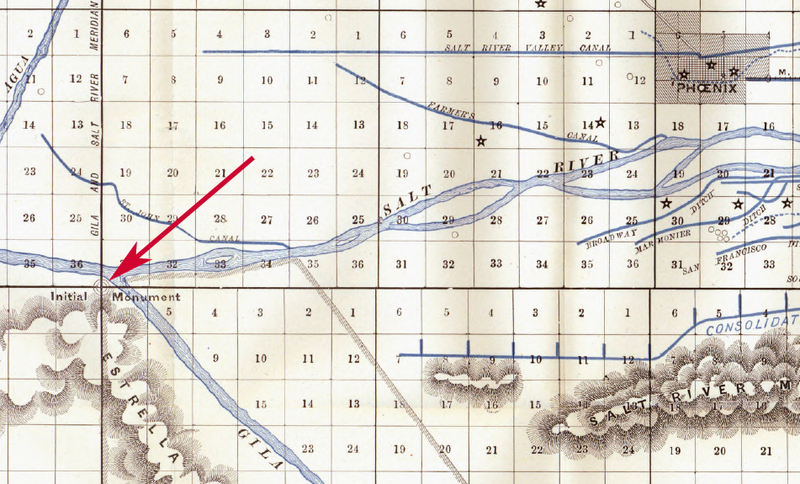 For whatever reason, the sections didn't line up to the north and south of the Arizona Baseline, which is nowadays Baseline Road. Of course, once something is measured and becomes legal, even a few hundred feet matters to a landowner. I've seen people here in my little suburban neighborhood in Glendale get upset if a brick goes past their property line even a few inches. So the roads had to stay along the edges of the sections. And that meant doing the "Baseline Jog" that you see to this day. Interestingly, looking at the map, you can see that the grid south of Baseline lines up well with the Monument, but that the grid squares immediately north of the Monument are slightly oversize. I'm guessing that when they finally surveyed everything, they jiggered the grid north of Baseline so that the center of Phoenix was one one of the regular grid lines. It's interesting! And I notice that things get way out of control over there towards Mesa!